Exceptional Ski-in/Ski-Out at Breckenridge Peak 8. Exceptional slopeslide true ski-in/ski-out location. 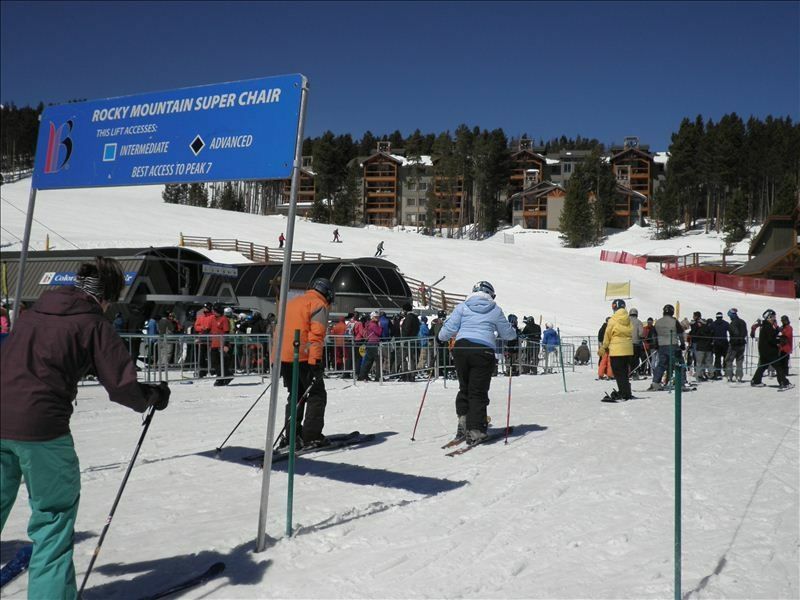 SkiWatch Condominiums are located directly on the slopes of Breckenridge Resort Peak 8. Ski from the condo to the Peak 8 Base, the Rocky Mountain Superchair, or Colorado Superchair for a quick ride up the mountain. The ticket office and ski school are located about 75 yards away. Ski in for lunch, and back out to finish the day. Relax in the slopeside hot tub at the end of the day and watch the last folks ride up the chair. Outstanding unit, excellent condition, quite comfortable for two families to share. We love the outdoors and spend as much time as possible snow skiing (or riding), water skiing, hiking and biking. We work hard so we can play hard! Skiwatch location CANNOT be beat! We are spoiled rotten! Washer and dryer are in the Skiwatch complex, not in individual unit. Coin operated. Our family of four loved our stay! The location of this property is awesome - truly a ski in and ski out - right on the mountain!! The condo is updated, very clean and quiet. Ruth is first class to work with - great communicator and very responsive. We loved our stay and will be back! I recently stayed at Ruth’s condo with my two adult children for a four day ski vacation. I found everything as advertised. The unit was clean,comfortable, quiet, and literally a short ski down to two chairlifts at the base of peak 8. There is convenient indoor parking, and the building is very secure, entry only by key. There are two hot tubs available to help soothe those sore muscles after a day on the slopes. I wish we could have stayed longer. I found Mrs Gardner to be a very accommodating owner. I highly recommend renting this property. It was a pleasure to host your family Dr. John! Perfect condo for families that love to ski in AND out! Our family of 8 stayed at this property (#328) and loved everything about it. True ski in and out with convenient ski lockers one floor below. Many kitchen condiment amenities that other condos clear out after each trip. Communication with the owner, Ruth Gardner, was also a plus. She is very responsive and truly cares about making your trip planning and experience a good one. We definitely recommend this unit and would book it again. So happy that your family enjoyed your stay in our vacation home Lisa! That's our ultimate goal! We have been staying at this location since 2007 - mainly Mon-Fri during Jan, Feb and the first week in Mar. The top of the photo to the left is Ski Watch Condo - the lifts are Colorado and Rocky. The amenities are fabulous. We absolutely love returning guests and John and Maureen "win the prize". You take wonderful care of our vacation home, often taking care of items that need attention and also keep us apprised of anything needing our attention. THANK YOU! The Skiwatch complex is well located on Peak 8 with ski in/ ski out access. This condo unit is updated and very well maintained. Having two queen beds in each bedroom with its own accompanying bathroom makes it comfortable for families. Included covered parking under the building and a ski locker adjacent to the slopes adds to the convenience. The owner is very accommodating and we would stay there again. Thank you so much Sandy! It was a pleasure having you as our guests and we would love to have you back again! Everything you need for a great stay in Breck! This was the second time we rented Ruth's condo on Peak 8, and I'm sure we'll be back again! The ski-in/ski-out option is so convenient, especially now that our kids are better skiers and can handle themselves getting down to the lifts, which are very nearby. The kitchen was well-stocked, and there's lots of drawers, hooks and cubbies to stash all our clothes and gear. The washer and dryer in the building are nice to cut down on the bulk of packing needed for a ski vacation. And Ruth is super friendly, quick to respond, and attentive to her guests! Another wonderful family ski trip! Thank you Sarah! We love repeat guests! Snowboarding (world class half pipe right near the condo), Summer activities just outside the complex include Alpine Slide, Human Maze, Climbing Wall, great hiking and biking trails. Will take reservations for less than minimum stay requirement if it fills in open nights on calendar.